Just like buckwheat honey, blackberry honey or chestnut honey, blueberry honey has a very strong antioxidant and antimicrobial power. Blueberries are perennial flowers which give us indigo-colored berries, much appreciated these days, especially in our smoothies. Scientific Name: Vaccinium spp. Vaccinium. Sounds familiar, doesn’t it? It does, but it’s not the same. 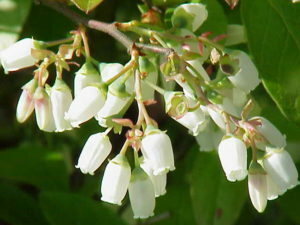 Vaccinium includes an “i” which is not found in vaccinum. Vaccinium – is the name used in classical Latin for a plant and it may be derived from bacca, berry. Vaccinum – denotes any substance or organism that provokes an immune response when introduced into the body. 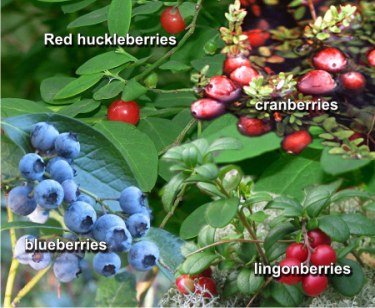 The genus Vaccinium (a genus which is part of the heath family) also includes cranberry, blueberry, bilberry or whortleberry, lingonberry or cowberry, and huckleberry. Blueberries are native to North America and can vary in size from 10 centimeters (aka Lowbush blueberries) to 4 meters (aka Highbush blueberries) in height. Between them there are lots of others: Brigatta, Chandler, Chippewa, Northsky, Top-Hat, Darrow, Duke, Liberty, Rubel, Spartian, Toro, Emarald, Legacy, Misty, Star, and Sunshine Blue, just to name a few. The flowers are very delicate, bell-shaped, mostly white, but some are pale pink or red, sometimes tinged greenish. For an optimal production of berries, insect pollination is required. The pollination season lasts from April to June. The fruit is a berry of 5–16 millimeters (0.20–0.63 in) diameter with a flared crown at the end. The color is pale greenish at first, then reddish-purple, and dark purple when ripe. The fruit appear in the middle of the growing season and depend on the local conditions such as altitude, latitude and weather. The peak of the crop can vary from May to August (in the northern hemisphere) depending upon these conditions. This fruit contain anthocyanins, polyphenols and flavonoids and appear to have the highest antioxidant capacity among common fruits and vegetables (Prior et al., 2000; Wu et al., 2004). Blueberries boost children’s reaction times by 9% due to flavonoids in the fruit improving brain cell communication! A study conducted by Professor Claire Williams from the University of Reading analysed 21 children aged between 7 and 10 years old. The study’s participants consumed 30g of freeze dried blueberry powder before being tested on their cognitive ability three hours later. Findings revealed that eating blueberries improved children’s reaction times by 9% without hindering their game result accuracy. While there are people believing that blueberry honey is made from wildflower honey with added flavor, most probably by infusion (like most lavender honey), there really is blueberry honey made from the nectar gather from the beautiful tiny flowers of blueberry bushes. 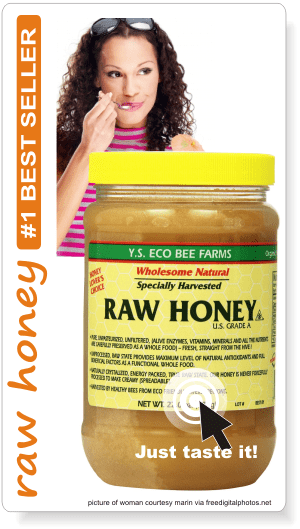 This type of honey is very common in Maine, Michigan, Oregon, New Jersey, California, Florida and Georgia. The people here use it a lot in sauces and baked goods, but they also swirl it in plain yogurt sprinkled with a little mint, drizzle it over any mild cheese, or smear it on top of fruit muffins. If you are in the area, don’t miss it. The book The Secret Life of Bees by Sue Monk Kidd, has a brief reference to purple honey and blueberries. 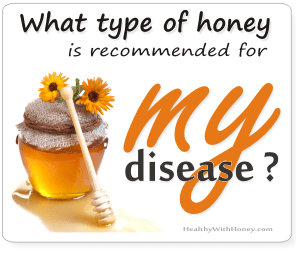 But according to honeybeesuite.com, purple honey only appears in the southeastern states, mostly in dry years, it accumulates in only some hives, and the amount produced is usually limited to a few frames or a partial box. Though the areas are covered by blueberries and elderberries, the kudzu flowers are thought to give the purple tone. Some other people consider that the purple/blue honey comes from sourwood trees that grow in soils andhave a high aluminum content. Taste: Strong and sweet with earthy components, slightly pungent and a smooth texture. (Some say it has a similar taste to blackberry honey.) Only flavored honeys have a very powerful blueberry taste. Flavor: full, pleasant, moderately fruity, with a slight tang and a blueberry aftertaste. Antioxidant level: very high. According to the Brock University, blueberry and buckwheat honeys have the highest antibacterial antioxidants, the majority of them are flavonoids. Antibacterial level: high, both hydrogen peroxide and non-peroxide type. The study Inhibitory activity of honey against foodborne pathogens as influenced by the presence of hydrogen peroxide and level of antioxidant power by Peter J. Taormina et al., published in 2001 by the International Journal of Food Microbiology, compared six types of honey for their inhibitory activity against the 6 species of bacteria. · The tested honeys were: Chinaso buckwheat (very dark color), Montana buckwheat (dark color), blueberry (dark color), avocado (medium color), safflower (light color) and clover (light color). · The analyzed bacteria: Escherichia coli, Salmonella typhimurium, Shigella sonnei, Listeria monocytogenes, Staphylococcus aureus, and Bacillus cereus. The study’s conclusion was that darker colored honeys are generally more inhibitory than light colored honeys. This is due to the higher antioxidant content of dark ones. During tests, the antimicrobial activity of the darker honeys was not eliminated by catalase treatment – which neutralized the enzyme oxidase, responsible for the hydrogen peroxide activity. This concluded to the existence of non-peroxide antibacterial activity, most probably derived from antioxidants. 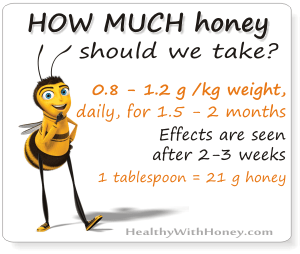 Read more on What gives honey its antimicrobial power? This observation that darker colored honeys have higher antioxidant power than light colored honeys confirms findings also reported by Frankel et al. in 1998. • Another study, Powerful bacterial killing by buckwheat honeys is concentration-dependent, involves complete DNA degradation and requires hydrogen peroxide, by Katrina Brudzynski et al., published in 2012, compared the bactericidal activities of eight honeys: six varieties of buckwheat, blueberry and manuka honeys. The study was made on standard strains of Bacillus subtilis (ATCC 6633), Escherichia coli(ATCC 14948), Enteroccus faecium (VRE2) and methicillin-resistant Staphylococcus aureus (MRSA6). The results showed that blueberry honey required the highest concentration (50% v/v) to kill MRSA6 and VRE2 as well as E. coli and B. subtilis; while buckwheat honeys and manuka did kill bacteria but they differ in their minimum bactericidal concentration. It also showed that bacterial killing by honeys correlated with a complete DNA degradation. Hydrogen peroxide played an essential role in the bacterial growth inhibition by being a substrate for hydroxyl radical generation. Hydroxyl radicals inhibited in a dose-dependent manner the growth of several MRSA and VRE clinical isolates as well as standard E. coliand B. subtilis. The bacterial killing by buckwheat honeys required hydrogen peroxide, but this was not the case with manuka honey and blueberry honey. After removing the hydrogen peroxide activity, by catalase treatment, manuka honey and blueberry honey still had bactericidal activity. What needs to be reminded here is that blueberry honey showed bactericidal effect only at the highest concentration tested (50% v/v). 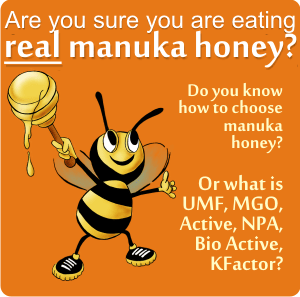 Due to their potency, buckwheat honeys and manuka could be diluted up to 12.5% v/v and still maintained their maximal bactericidal efficacy. The darker, opaque, unprocessed honeys contain the highest levels of antioxidant power, which contribute to antibacterial activity. · In association with verapamil, vitamin E and topical diclofenac, had the highest rates of success in treating patients with Peyronie’s disease (study). The same combination but using propolis instead of blueberries, came second in the study. · Due to its compounds: anthocyanins, polyphenols and flavonoids blueberries may also cure chronic diseases through anti-inflammatory and anti-fibrotic effect mechanisms. Anthocyanosides help to prevent diabetics from injuries caused by malfunction of synthesis-activities throughout normal diabetic medical treatment. (Boniface & Robert, 1996). · Blueberry anthocyanins are also able to inhibit NF-κB, iNOS and COX-2 expression (Karlsen et al., 2007; Wang et al., 2008). Where can I find blueberry honey? 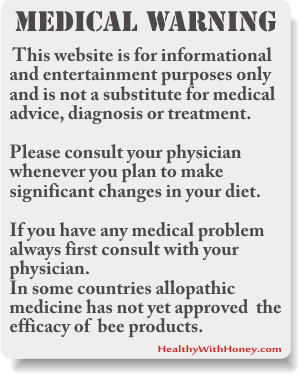 On your local beekeepers, of course, and on the online markets, which are plenty. Only be sure when reading the label. Some are blueberry flavored honey, some are real blueberry blossom honey. but also real blueberry blossom honey from Maine: Maine Blueberry Raw Honey (10.5 ounce) , or from Canada: Billy Bee Honey Blueberry 100% Natural, 13-Ounce Bottles (in the picture). Amazon.co.uk has it, too: The Oxford Honey Company Blueberry Honey 227 g (Pack of 3) – 100% raw honey predominantly blueberry (Vaccinium angustifolium) pollen. ginger, lemon, melons, nutmeg, sour cream, walnuts and yogurt. What bacteria can honey kill? What is Tupelo honey?